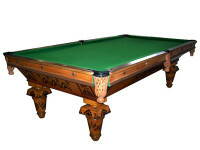 Antiquarian Traders has been an established dealer in rare and unusual antiques for over thirty years. 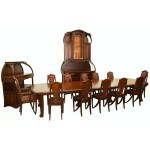 We specialize in mint condition antique furniture and museum quality pieces from the 19th and early 20th century. 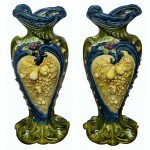 We trade, rent and purchase antiques as well. 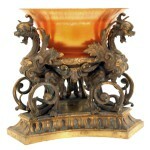 Antiquarian Traders' furniture has been featured in dozens of Hollywood films. Our 75,000 square foot showroom in downtown Los Angeles houses thousands of antiques. Anyone is welcome to visit our showroom or you can visit us online. Our website is updated daily so remember to come back regularly and check for new inventory! 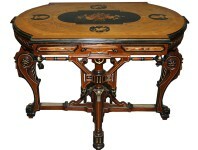 We stock quality antique American Victorian furniture, antique desks, antique dining sets, antique tables, antique cabinets, architectural pieces, antique entry gates, antique chandeliers, antique mirrors, antique stained glass, Steinway pianos, antique paintings, Brunswick pool tables, Art Deco sculptures, American rolltop desks, Wooton desks, including furniture from the 19th Century Period. At Antiquarian Traders, you will find the premier American designers including: Pottier & Stymus, R.J. Horner, John Henry Belter, Herter Brothers and Thomas Brooks, the American cabinetmaker. We also feature pieces by French greats Louis Majorelle and Emile Gallé, the acclaimed glassmaker who is considered to be one of the major forces in the French Art Nouveau movement.